Grizzly has joined forces with the classic Adventure Time Cartoon Network TV Show, showcasing a deck and a line of custom made sheets of grip tape, this being the Boo Grip Tape. Featured with a graphic of the show's main characters, Finn the human and Jake the dog, Jake with elongated legs with Finn riding on top of him. 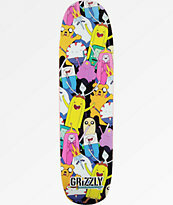 Boo Grip Tape from Grizzly x Adventure Time. Signature Boo Johnson pro model grip. Signature Grizzly and Adventure Time collection.